This entry was posted in Uncategorized and tagged buddhism, koun franz, monastery, sesshin, tangaryo, zen, zuioji. Wonderful! I did tangaryo in that room too! In early September. Hot hot hot. Thanks for jumping into the blogosphere. Your voice will be an important one! A great description of the trips of the mind during tangaryo. I did it twice, one at Shobozan Fudenji in Italy (a week) and in Tassajara (five days). No tangaryo at the Nisodo. They do not do it, but all year was a tangaryo for me. Thank you for your nyoho voice. Thank you. Interesting that the nisodo doesn’t do tangaryo. I’ve heard from people who have done tangaryo multiple times that they intense, dark-night-of-the-soul version only happens once, that the second or third time around, you’ve already resolved those issues at a basic level. I’d be curious to hear if this was your experience as well. You are right. I experienced the “intense dark-night-of-the-soul” at Fudenji, until I realized that the question I got asked daily, “What are you doing here?”, could not be answered in the way I thought. So, I gave it up and, then, relax. The tangaryo in Tassajara was different. I was not alone, by myself; there was around 15 more practitioners with me. I just sat for five days, almost never even got up to go the restroom. It was a peaceful sitting, you can call it the basic level of sitting. I hope you do come back. Please let me know. Hi Koun, Thanks for this insightful post. I agree that there can be seen to be quite a contrast between what the Japanese bald men brought over the seas and US/Western ‘freedom’ culture. However, is it really fair to compare the two? Didn’t the Japanese chaps really bring a form of aspirational lay Buddhism west, not a strict traditional monastic model? I wonder how you percieve the role of lay Buddhism in this, and it’s historical contributions. I suggest that Buddhism is now better placed in the west due to this compared to Japan where lay practice seems to be in a rather precarious place. First, you bring up an important point about the Japanese teachers who first came over. My impression is that, generally speaking, they were quite counter-cultural in their own right. I’ve read that many (if not all) of them were fed up with the decay of Buddhism in Japan and the bureaucratization of religious institutions; they wanted to leave that scene and establish something more pure. That sets them apart from many of their colleagues. But I believe that whatever they brought over as teachers was inseparable from their intense experience as monastics. Some people from that time will sometimes describe those teachers (especially Suzuki-roshi) as having an almost magical presence, but in those descriptions, I see so much that is common to people who have trained for a long time in a particular system. They were products–wonderful products–of a particular system. What I also find striking is that, at least in the case of Suzuki-roshi, then Katagiri-roshi, a big part of the dream, after establishing this zazen-centric practice, was to then establish traditional monastic practice. They seemed to see that as a critical piece of the puzzle. The successful cultivation of lay zazen practice in the West is one of the most exciting developments in Buddhist history (the really big one, related, is the embrace in Western Buddhism of women). There is lay practice in Japan too, of course, but it’s of a different shape, and it hasn’t been given all that much value. Part of that is an idea (still strong) that if you’re really serious about zazen and the practices that surround it, you should just go ahead and be ordained and investigate it in a monastic setting. I’ve bumped into that a lot, and it still surprises me sometimes. Town by town, center by center, the focus of practice is lay practice and lay practitioners, and that’s not at all a bad thing. It’s something to celebrate. The US, at least, is dense with little secret zazen groups in tiny towns–there’s tremendous strength in that shape of the practice. But on a larger scale, I think we need to find ways to cultivate priests–people who are willing to take on that public role, who are willing to be responsible for the aspects of Zen that are not as easily understood or easily embraced as zazen. Without a strong investment in those people, I think much will be lost in the next few generations. There’s more to this than what can be offered at the average Zen center–to see it in its totality (as it’s been passed down), we need places where people are engaged directly in the practice 24 hours a day. I appreciate the lay/priest issue coming up here. Katagiri Roshi was shocked and intrigued by the counter culture, although a Japanese Hippie in some regards! … and exactly as Koun says, thought that monastic training for some really important. I agree for the reasons Koun gives. 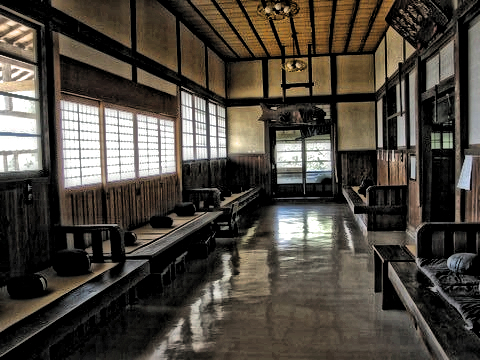 One additional thought, the lay practice movement in Zen arose in a 20th Century historical context – across several traditions serious lay practice was emergent while the number of people doing monastic practice dropped dramatically. At least several million people world wide were in monasteries in Europe, Asia, and the Americas in 1900 but a fraction of that in 2000. Maybe without knowing it, Katagiri Roshi and Suzuki Roshi were part of the big “descoping” of the monastic traditions, finding portable practices for the lay movement – in their case, especially the form of zazen. In a similar way, Yasutani Roshi and Harada Daiun Roshi took the traditional Rinzai koan system and simplified it so that it could done by lay people. Not sure where that historic trend is going – after 50 years of zazen practice and many many more lay practitioners in the US, there are not many more monastics than there were in 1980. I realize there’s a lot of resistance to that kind of thinking–I used to believe exactly the opposite of what I’m saying now. I doubt that any reasonably serious practitioner (or even a lazy layman like me!) would harbour too much resistance to the need for serious monastic practice/training places; especially if we can acknowledge that it is not for everyone, and that there are other contexts in which people can engage in meaningful Buddhist practice and observances. IMO, the backlash against religious institutions and their creaking hierarchies is long overdue in the west, given our unfortunate history (I live in ireland… enough said!) The abuse of power of one person over another, and casual cruelty arising from it (as you describe), is now a much more serious issue in western societies with the recent institutional and cult abuse scandals/ crises (in fact, not so long ago it just didn’t even exist as an issue given the dire power imbalances that existed eminating from those white men at the top of the pile). From what I’ve read of accounts of people who have underwent monastic Zen training cruelty from superiors seems to be considered somewhat part of the parcel. That’s something that I hope does not translate into a western monastic model: It’s taken us years and many destroyed lives and broken hearts in order for us to start getting our own religious affairs in order in this regards in the west (and there is still much to strive for). I would suggest that facilitating such cruelty by accepting it on our person is unethical, is a violation of the Bodhisattva Precepts, and has no place in institutions or any area of civilised society. Again, big questions. You mention that I describe casual cruelty in this post, but that’s not what it was. It was far from casual, and hardly cruel–if anything, it was cold, by design. But I could have left anytime. That said, it should be acknowledged that I, as a Westerner and a person who came to the priesthood from a lay life, knew better than many of my peers that I could always just walk away. Other young monks who were raised in temples and set to inherit them from their fathers probably felt that they had very little choice in the matter, and it’s very likely that for them, the process itself was a kind of cruelty, again by design. That is an unfortunate side of things on this side of the ocean. I agree with your concerns about the dangers in these kinds of institutions, and also with your reasons. For those reasons and others, there is a strong distrust in the Western Zen world of institutions and of vertical hierarchies in general. I understand that, and I know that many groups have lived through a lot. But I had a great experience in the monastery, even when it was terrible. I would not trade it for anything. I love it. My understanding of this practice is inseparable from that world. So I will continue to hope that we will set our sights high–not on transcending institutions altogether, but on cultivating people who can help those institutions to find their highest expression. In spite of the dangers, I hope we don’t give up on that possibility. I’ll add, by the way, that there are plenty of “reasonably serious practitioners”–teachers, in the Soto world–who feel that monastic practice has no place in Zen. I’ve been privy to some of those conversations. For many people, anything that structured is just simply absurd. …p.s. I know for a fact that institutuional abuse of power, and attendant cruelty, IS happening in at least one prominent European monastic-geared centre. So it’s already a current issue. I suspect we’ll hear about it soon enough… maybe in 20-50 years or so after the horse has bolted. That surprises me. I don’t see any good reason for such an extreme line of reasoning even if some approaches to monastic practice sometimes seem a bit overboard to me personally. In saying that I think any organisation, especially religious ones where people may be vulnerable due to their deep expectations, and the convoluted desires of others, should have inbuilt organisational checks to avoid the excesses of hierarchy and the general human messiness around power relationships. It’s really not that difficult to do and I think that history more than justifies it. I quoted pieces from your piece about tangaryo for my ‘talk’ this Sunday. I based my talk on Red Pine’s translation of Bodhidharma’s “The Bloodstream Sermon” wherein he presents the idea of that the mind is nature, our nature is the mind, the mind is the Buddha…so why go looking elsewhere for the Buddha? You may not have the “merits?” of nine years of wall-sitting, but your descriptions of tangaryo seemed to a taste of what nine years may have included. It may have contributed to your impulses to frame this character in novel-form? The Anchorage group continues on…. I wish I could have heard your talk. I am still fascinated by Bodhidharma, but that fascination keeps changing. I recently had occasion to look back at that attempted novel from years and years ago, and I could hardly recognize myself in it. I told my advisor at the time, “I have an idea, but I’m not ready to write it.” He said that was crazy and encouraged me to try anyway (and I’m glad), but that doesn’t negate the truth of what I told him. That novel, if I ever go back to it, can be like my death poem, a record of how confused and deluded I was at various stages of my life. My thoughts are with the AZC. Shri.Koun’s conversations here, surely narrows and broadens the gaze. Thanks. Were you forced to sit full lotus the entire tangaryo? Had you been sitting in that manner up until that point? Hi, I enjoy reading your blog posts and I came across this one on Tuesday. So I know it’s a bit late but I wanted to respond. I am a zen priest in training and I should soon go to Japan to do an ango. I wonder how old you were when you did the tangaryo practice that you spoke of above? I am fifty seven years old and have had major knee surgery. I just can’t imagine how someone in my age and physical condition can attempt such an effort as this. You said you had trouble walking to the bathroom when you would get off of your cushion. Often I have trouble walking when I get out of the car. The demographics of priest trainees in America is completely different from those in Japan. Should or can we try to place ourselves into this model?